HONG KONG – Davide Linzi of Mister X Service designed an audio system centered around Outline’s Newton multi-source audio processor for the main and second stages at Clockenflap, a multi-genre music festival. Clockenflap is one of Asia’s biggest multi-genre music festivals, held each year in Hong Kong. Now ten years old, the festival is a firm favourite in the region, with its extensive programme of music, art, film and other activities. In addition to a line-up of internationally renowned artistes – which this year included Erykah Badu, David Byrne, Khalid, Roni Size, Interpol, Caribou, Anpu and The Vaccines – the festival also offers a platform to local talent, helping them reach a wider audience. For the 2018 edition of the festival (9-11 November), the main (Harbourflap) stage and second stage were managed by Alto Stage Management, who called in Davide Linzi of Mister X Service as audio system designer for both and FOH engineer for the main stage (assisting productions with their own sound engineer). Linzi explains why he took Outline’s Newton multi-source audio processor with him for the important event. 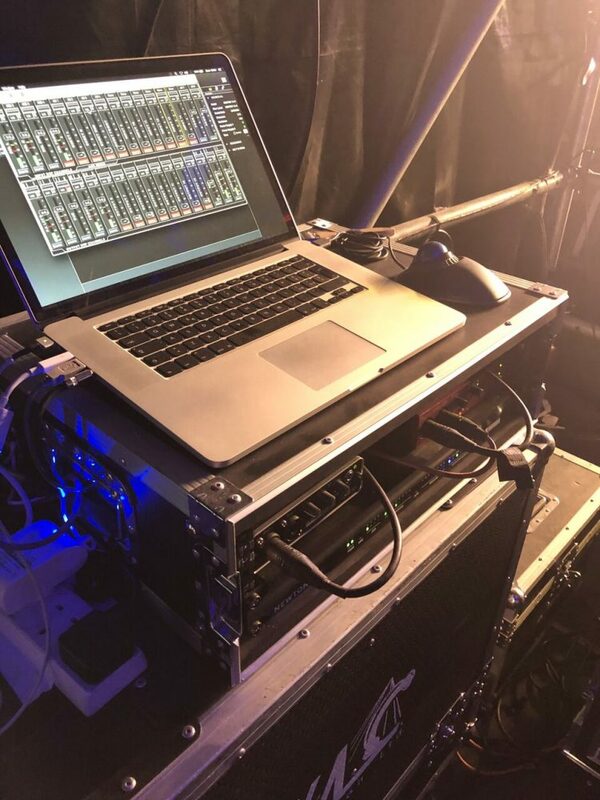 “I decided to take Newton to Clockenflap because I needed a fast versatile unit that enabled me to create a matrix of inputs and outputs that was fast and effective to manage and control. My workflow required 10 independent inputs always connected with the L-R-SUB-Front fill of the main S6L console, L-R-SUB-Front fill of the guest console, L-R of a production mixer handling walk-in music, publicity audio and emergency and MC mics; the outputs on the other hand involved independent control of L-R-SUB-Front fill-L/R Outfill, L/R Delay, a stereo feed for streaming, a reference signal for Smaart and a pair of Dante signals for L/R recording if requested. The major EQ settings carried out during PA tuning were done on Newton, as were any modifications request by artists’ sound engineers. Newton wasn’t a casual choice: the fact of being the core of such a complicated system and having two independent redundant power supplies was a safety factor that reassured the festival’s producers, who are very demanding as far as reliability criteria and the sound quality of the stages is concerned. Another fundamental aspect in certain contexts is the enormous flexibility of the matrix and the ease with which numerous I/O can be controlled without worrying about incorrect clock settings, as the unit takes care of ASRC automatically. In the past, I frequently had problems not so much with finding user-friendly systems able to handle such a large amount of signals, but finding users able to provide me a laptop ready to run and the equipment configured: previously, I always used another brand, which I consider a top grade unit, but one is often limited by the routing and the amount of signal transport required to interconnect several units: having the possibility of processing 16 inputs and 16 outputs simultaneously in a single rack unit, which I configured in less than 5 minutes once Dashboard (Outline’s control software) was connected greatly streamlined by work.